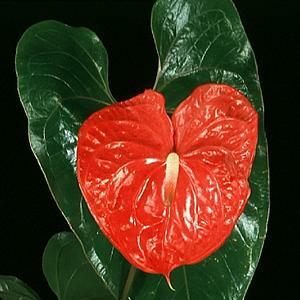 Use Flower Servant and it will remind you when to water, mist, fertilize or repot Anthurium andreanum. Click here and try for free! Anthurium andreanum grows in wet forest from about 400-1200 m. as a viney epiphyte. The cultivated forms of this species have been hybridized for many many years and form the basis for the most important cut flower crop in Hawaii. Although the name applied to these cut flower plants is usually A. andreanum, many in fact are hybrids of several closely related species in section Calomystrium and are more accuratly reffered to as Anthurium X cultorum Birdsey. The main differences between the cultivated varieties and the wild species are a compact suckering habit and a broad range of colors and patterns in the cultivated hybrids vs. a veiny habit and only the bright orange-red spathe in the wild species. Varieties are available in shades of red and pink and white and with large flowers. Plants raised from seed exhibit variations in colour shape and size of the flower. The most colourful part of the flower is the spathe. Anthurium andreanum makes an excellent pot plant with glossy green leaves and flowers held on tall petioles. Requires warm growing conditions. Excellent for cut flower use with a long vase life.